The Best Party Of Their Lives"
There's nothing worse than going to a children's party where there doesn't seem to be anything organized. It doesn't take long before kids start running all over the place getting into as much mischief (or food!) as they possibly can while other young ones, all alone, sit in a corner sobbing their little eyes out, bleating the heart-wrenching cry, "I wanna go home!" "When are we gonna eat?" And then you realize the parents won't be back to pick up their little trouble mak... Oh, I mean, little darlings for at least another 2 hours! My name is Andrew Low and I've been to quite a few of those 'disorganized' parties. And, as a father of 7 children all under the age of 20 as well as a school teacher of twenty years, I know how quickly children can get bored. most fun party they could ever wish for. Maybe at your own child's last party, you were hoping the children would entertain themselves quietly and happily. But it didn't take long to realise that bedlam was just about to erupt! You had 20 children running through your very tidy house, tracking dirt all over your recently vacuumed carpets, knocking over precious pot plants (or worse - the beautiful ceramic, hand-painted, three-tiered pot-plant pedestal that Aunty Kay gave you for your wedding), hiding in the bedrooms (including yours which you thought you had locked! ), finding and painting themselves with the lip-stick and nail polish they found in the bedroom, yelling and screaming the whole time. Did You Get A Little Frazzled? and chaos ruled the day! ✔ most importantly, shows your child, how much you love them! Yes, a fun and enjoyable party needs good planning (my wife does a superb job planning the food), but if you've got an entertaining and lively variety of games planned then the time will fly very quickly and soon the parents will be knocking at your door waiting to collect their wonderful, extremely well-behaved children! Instead of being bored, your child's friends will be telling everyone that they had the best time ever! "We had lots of games and party food ..."
"We had lots of games and party food for my 10th birthday. It was so much fun with my friends. Even though it was raining we played lots of games inside". "My party was really fun ..."
"My party was really fun. Dad organized lots of games and mum organized the food. It was so fun, we played so many fun games, even a rabbit and fox game." Are These Games Suitable For? In Fact, Any Kind Of Celebration At All! 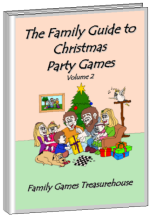 You'll find a very comprehensive index at the front of "The Family Guide to Party Games" which will show you at a glance everything you need to know about a particular game. In fact, why don't you take a look at the index right now. "I really appreciate the effort my parents put into making my Graduation a fun day for everyone. They organized heaps of games, not only for the adults and teens but also for the young children who came along as well. Thanks Dad and Mum, You Rock!" "Dad and Mum did a fantastic job organizing and running the games at my 18th birthday celebration. Everyone loved them and immensely enjoyed the evening. The trivia competition, which was interspersed throughout the night kept everyone on their toes with some very close rivalry between the guys and the girls." ✔ Instant access - Available for your party today! Did you know that you don't have to use this book for parties only? 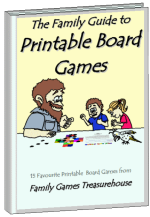 There are heaps of games in this book that can be played with as few as two people? That means you could use this book just for your own family. "Family Games Nights Are Great!" 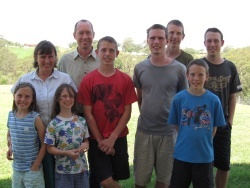 "Family Games Nights are great because the whole family gets involved and we have heaps of fun together." 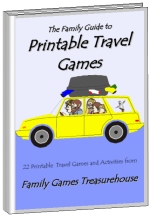 "Playing family games together is a great ways to build family relationships. We have been having Family Games Nights for as long as I can remember and they are tons of fun with lots of noise and laughter. "Games Night Is Often Really Fun"
"Games Night is often really fun. I probably like the dice game, Pig, the best. I really appreciate how mum and dad keep trying to do it each week. I Guess You'd Like To Know How Much This Is Going To Cost? We love families. In fact, we're passionate about them. And we want to do everything we can to promote happy, healthy, loving families. If this book helps you become closer as a family then we'll be more than happy! So, what are you waiting for? With Christmas just around the corner now is the time to get those games organized! This report outlines a number of issues you should consider when choosing your party games. Understanding these issues will go a long way to ensuring your child has a very successful party. 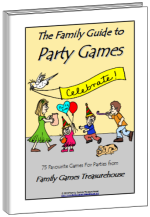 "Party Theme Ideas For Kids"
With over 200 ideas to choose from you'll enjoy browsing through this e-book and making great plans for your child's next party! Bonus #1 "Choosing The Best Games For Your Child's Party"
Bonus #2 "Party Theme Ideas For Kids"
All for the very low Super Special Price of $14.97. 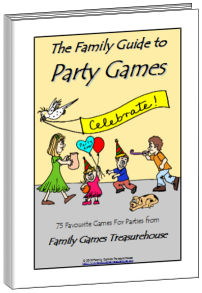 These are our special bonuses if you order "The Family Guide to Party Games" right away. Why Am I Making You This Terrific Offer? Firstly, these products that I am offering to you are all delivered to you as a digital download package. I don't have high printing costs and can therefore pass the savings directly on to you. Secondly, you don't pay for any postage, and you get the books immediately! Finally, I want to over-deliver. I want you to be very pleased with your purchase and know that you can trust our products and my company. I am offering a 100% money-back guarantee if you are not totally satisfied with our product. I will refund your money with absolutely no questions asked. My company is built on integrity and strong moral values. I want you to be totally happy with your purchase. All you need to do is click on the Buy Now button and you will be taken to a secure order form. Simply follow the instructions given. You can pay with either PayPal or credit card. When you have completed your payment you will be taken to a secure download page where you can download all the e-books straight onto your computer. If this doesn't happen immediately, click the orange button that says "Complete your purchase". You will also receive an email with the download instructions. However, if you have any problems or questions at all then please feel free to contact me and I will be happy to help you. Don't miss out on this great offer and risk turning your child's next party into something that you will regret. Instead make it the best party ever. Go ahead and order right now. I know you'll be happy you did. P.S. If you are unhappy in any way with your purchase we will happily refund 100% of your money. Guaranteed! No questions asked. P.P.S. Families are the best. Give your children some wonderful memories of their childhood. If you have any problems downloading the e-books contact us and we will help you. 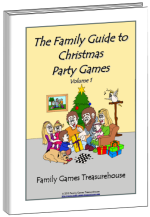 Subscribe to our FREE newsletter and you can download a copy of our ebook "25 Family Dice Games" as a free gift. •Our children's names have been changed to protect their privacy.